This long awaited subcompact is worth every second it took to get here. Hold the presses! The Boss is back! 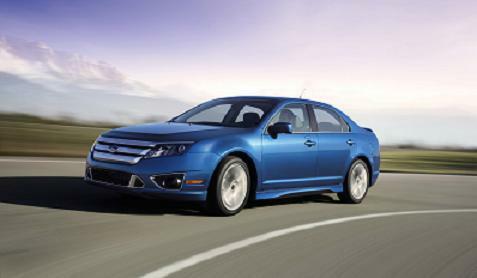 Yep, Ford's iconic Boss Mustang is back for 2012--though you will be able to get one before 2012 rolls around. This tuime around it's being billed as the Limited production 2012 Mustang Boss 302, and proud company officials say that it will be the quickest, best-handling straight-production Mustang ever offered by Ford, based on the world-class foundation provided by the 2011 Mustang GT. 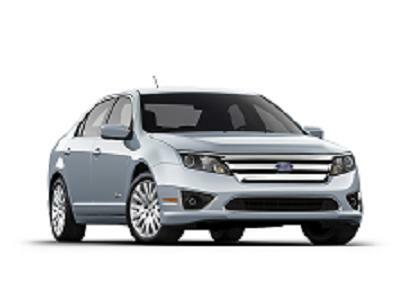 Ford officials toiled to upgrade nearly every system in this car over and above the standard model line. 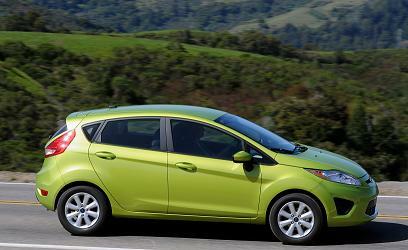 Their efforts include big improvements to engine output, brakes, suspension, interior and exterior. 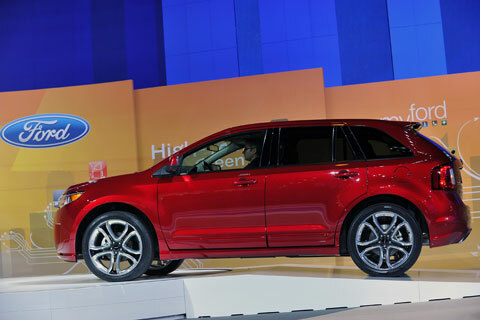 The goal all around was to "optimize weight, aerodynamics and track performance," according to a Ford news release. “The decision to build a modern Boss was not entered into lightly,” said Derrick Kuzak, group vice president, Global Product Development. “The entire team at Ford felt the time was right and with the right ingredients, the world-class 2011 Mustang could support a successful, race-bred, worthy successor to the original Boss 302. For us that meant a production Mustang that could top one of the world’s best – the 2010 BMW M3 – in lap times at Laguna Seca. 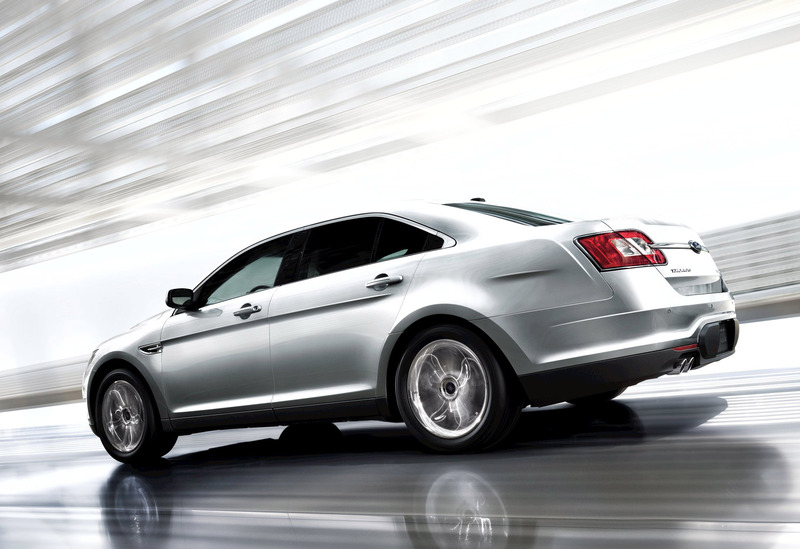 We met our expectations.” Led by Mike Harrison, the V8 engine team approached Boss from the top down: With 412 horsepower from 5.0 liters, the 2011 GT engine was already an incredible performer. But to achieve the high-rpm horsepower that would make the engine competitive on the track, a new intake was essential. The resulting runners-in-the-box plenum/velocity stack combination the engine team developed was impressive enough that it got the green light after one short drive. Helping the intake build power, revised camshafts using a more aggressive grind are actuated with the same twin independent variable camshaft timing (Ti-VCT) mechanism used on the Mustang GT. More aggressive control calibration yields 440 horsepower and 380 lb.-ft. of torque, while still offering a smooth idle and low-end torque for comfortable around-town driving. 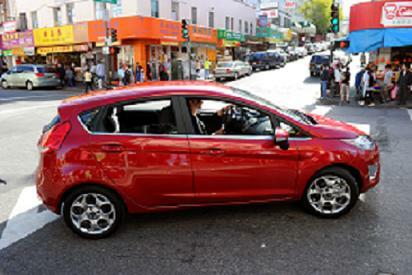 A race-inspired clutch with upgraded friction materials transmits power, while a short-throw, close-ratio six-speed manual transmission handles gear change duties. Power is delivered to a 3.73 ratio rear axle using carbon fiber plates in the limited-slip differential to improve torque handling and longevity. For those who want even more precise control over power delivery, a torque-sensing (Torsen) limited-slip differential is an available option coupled with Recaro front seats. While the powertrain team defined output targets that would yield an ideal balance with the chassis, another team made sure the car made the kind of sounds owners and enthusiasts would expect from a Mustang Boss. Up front, a Boss-specific intake system is tuned to feed the engine with minimum restrictions. 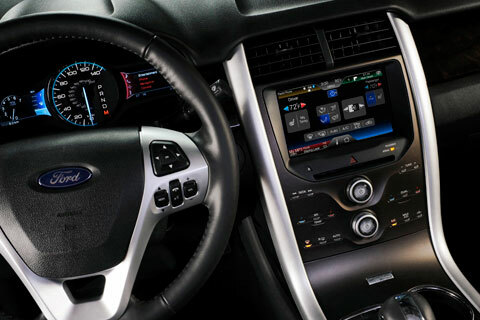 A retuned induction sound tube provides concrete aural evidence of what’s occurring under the hood. And, in the Boss exhaust system engineers really had some fun. “With an exhaust system, we have to consider three constraints: legal noise restrictions; backpressure, which can rob power; and ground clearance,” explains Shawn Carney, Mustang NVH engineer. “Since the 2011 Mustang GT exhaust is already so free-flowing – it came in way under our backpressure targets – we already had excellent performance; we were able to tune the exhaust system for a unique sound. Combined with the rush of the intake, the exhaust system really envelops the driver in V8 sound. Every Boss features a unique quad exhaust system: Two outlets exit in the rear similar to a standard Mustang GT. The other two outlets exit to either side of the exhaust crossover, sending exhaust through a set of metal discs that act as tuning elements before the pipes terminate just ahead of the rear wheel opening. Visually subtle, the side pipes flow very little exhaust but a lot of exhaust sound, providing a sonic experience unlike any other Mustang. 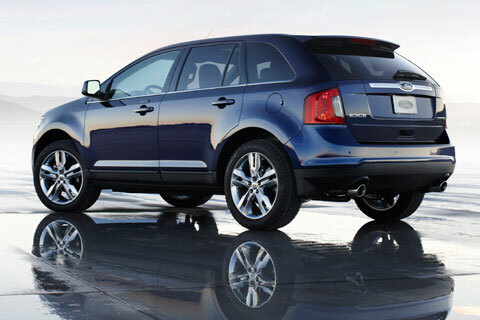 Of course, Ford wanted that Boss look inside and out, so big changes were made. Every part of the car that could help aerodynamics or engine/brake performance was examined to make the vehicle more competitive, while chief designer Darrell Behmer refined the styling to evoke the 1969 Boss in a contemporary way. To set Boss apart, each car will have either a black or white roof panel, coordinated to the color of the side C-stripe. Available exterior colors are Competition Orange, Performance White, Kona Blue Metallic, Yellow Blaze Tri-Coat Metallic and Race Red. Up front, a unique fascia and grille are highlighted by the blocked-off fog lamp openings and aggressive lower splitter, a version of the design used – and proven – on the Boss 302R race car. The front splitter is designed to function at high speeds by efficiently managing the air under and around the car. It helps to reduce underbody drag and front end lift while more effectively forcing air through the Boss-specific cooling system. At the rear of the car, the spoiler was chosen to complement the front aero treatment and minimize overall drag. “What we were after on Boss was reduced overall lift with improved balance,” says Pericak. “We needed to keep the car glued to the street or the track at high speeds without increasing drag or affecting top speed and fuel usage. The end result is an aero package that uses front, rear and underbody treatments not for show, but for effect – the balance and stability of this car all the way to its 155-mph top speed is just outstanding.” Inside, a unique Boss steering wheel covered completely in Alcantara suede complements the standard seats, which are trimmed in cloth with a suede-like center insert to firmly hold occupants in place. 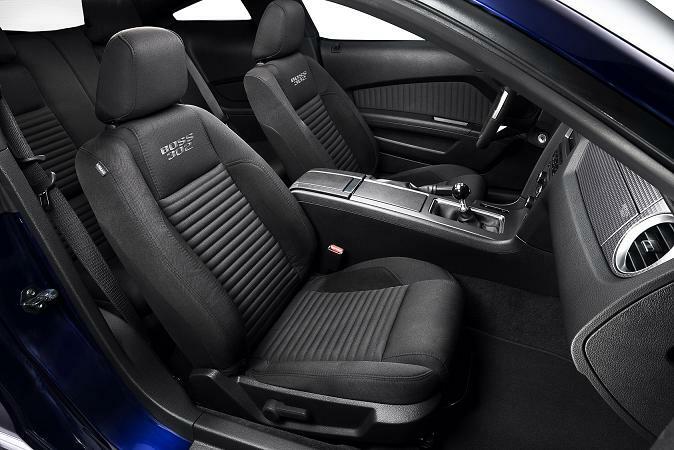 Boss customers who want the ultimate seating experience can select a package that includes Recaro buckets, designed by Ford SVT in cooperation with Recaro for high performance Mustang models, and shared between the Boss and GT500. 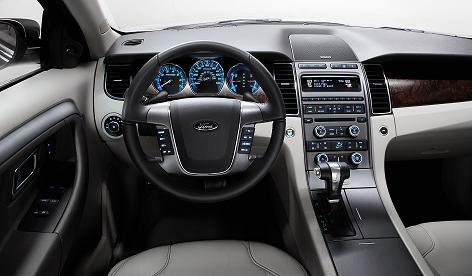 A dark metallic instrument panel finish, gauge cluster and door panel trim also differentiate Boss from the standard Mustang, while a black pool-cue shifter ball and “Powered by Ford” door sill plates further remind customers they’re in a special car. 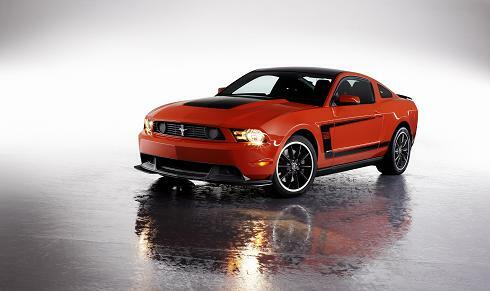 Now if you really want something special, conside the race ready Boss302 Laguna Seca model. Its suspension is even more aggressive than the standard Boss 302 model.and it has its own special chassis and aerodynamic tuning. This one is strictly designed for weekend racers, and the car doesn't have the creature comforts you'll find on the regular Boss 302. Laguna Seca cars are powered by the same engine, a 5.0 liter, 440 horsepower V-8 which already was specially trained for road racing. Engine power routes through a six-speed close-ratio manual gearbox to a standard 3.73-ratio Torsen limited-slip differential, helping the revised rear suspension deliver maximum torque and traction under the punishing conditions encountered on the track. Higher spring rates and a larger rear stabilizer bar – all upgraded over Boss specifications – help generate unrelenting grip, Ford officials say. And drivers can dial in exactly the level of shock stiffness a particular track requires using the four standard, independently adjustable dampers with Laguna Seca-specific valving. The final touch for a proper race car was to add the proper wheels and tires: Laguna Seca models use lightweight 19-inch alloy racing wheels in staggered widths: 9 inches in front, 10 inches in the rear. R-compound ultra-high-performance tires, 255/40ZR-19 in the front, 285/35ZR-19 in the rear, maintain contact with the pavement. The rest of the Mustang line is highlighted by a magnificent new V-6 that will absolutely blow your socks off. It’s a 2.5 liter, 175 horsepower job that will likely make some people wonder if they really need a V-8. Better yet, it will hit 60 in just over five seconds, according to published reports. And of course, the big news is that the famed 5.0 liter V-8 is back in a new and modernized way. It’s a 5.0 liter V-8 that comes in a 402 and 412 horsepower form. You can also now get a six speed manual or automatic. If for some reason you need more ponies--forgive the bad joke--you can lasso a Shelby GT500, which has a 550 horsepower, 5.4 liter aluminum V-8. 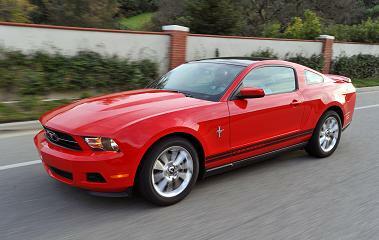 Mileage estimates for Mustang ranges from 15 to 19/23 to 31 miles per gallon. Ford should be commended for freshening the Mustang’s appearance without losing its almost unsurpassed heritage and styling cues. It’s a real looker, and many think it’s the best of the pony cars. Ford trucks It’s more mojo this year for these big guys. There’s a new 6.2 liter, 385 horsepower V-8. And a turbo-diesel 6.7 liter, 390 horsepower V-8, both for the Super Duty models. You’ll also notice that there are some styling changes as well. Other than that, and a couple of new colors, we’re told, there’s not much else that’s new.